I am a huge fan of MasterChef Australia. I do not have a TV set right now (yep! it is true!) but last Season I remember I used to rush into the kitchen as soon as I returned home, just so I could finish cooking dinner before the program aired. I would force everyone to have dinner sharp at nine so that the kitchen would be cleaned for the night – all this to ensure undisturbed MasterChef-watching. I can’t tell you the excitement I felt when participants were given a mystery box challenge. My kids and I would fidget during the break and guess what was inside the box. For a long time, even after the Season finale got over, we would talk about the program and watch reruns on you tube. The only jargon that existed in the house was ‘mystery box’, ‘pressure test’, ‘invention test’, and ‘celebrity chef challenge’. Whenever I cooked something exotic, my son would adopt George’s style and jump around telling me what was good and how it could be better, and the word ‘mate’ was generously sprinkled all over, like salt and pepper! My daughter would sometimes dip a finger, lick and smack her lips in appreciation much like Gary. Matt Preston, I am afraid was inimitable! The only thing they would do to replicate him was place their hands below their chin in silent evaluation. Yes, that was totally him – the food critic. Even now when a dish comes out well, the highest praise I get from my children is – “Mama, you are truly MasterChef!” And I know they don’t mean MasterChef India or MasterChef America. Not only the judges, but even the participants held our attention equally. My favourites were Claire, Skye, Marion, Jonathan, Peter (the lawyer) and of course Jimmy. My son watched all the episodes on youtube before it was aired on television and though we thought it was wrong to watch, all of us gave him company. It did not dampen our enthusiasm one bit when we watched the TV telecast. I remember one evening when I went to a relative’s house and missed one episode. After that I never went out for dinner or social evenings as long as the program lasted. Yes, that was how addicted I was. Naturally, when I saw an invite in my inbox that told read, “Greetings! Please find below your invite to the Masterchef Australia Press Meet where Matt Preston, the world renowned judge and food critique will do a live cook off! !” I was bouncing around and jumping for joy. For two whole days all I did was packing and unpacking, wondering whether I was taking the ideal gift for Matt, would I get to meet him, would it be appropriate to gift and would he accept it, etc. 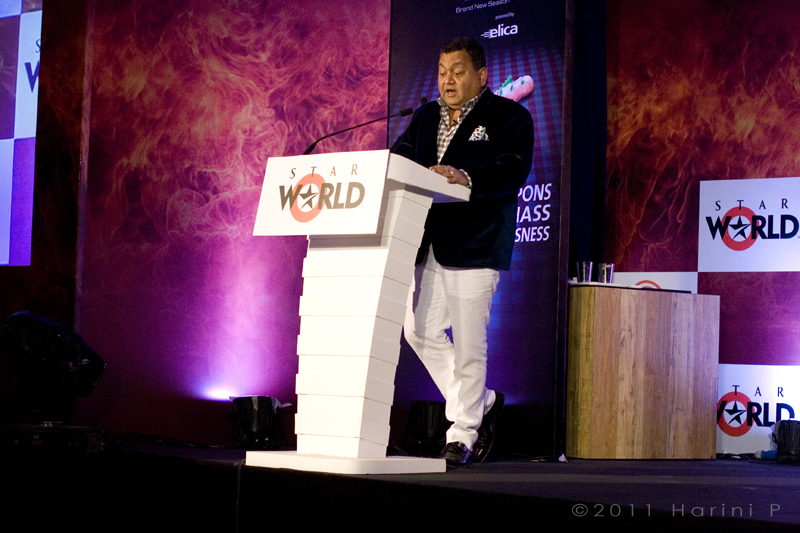 The press meet was organized by Star World at ITC, Grand Central at Lower Parel, in their ballroom. I reached there and found Vinda and Nikhil at the lobby. 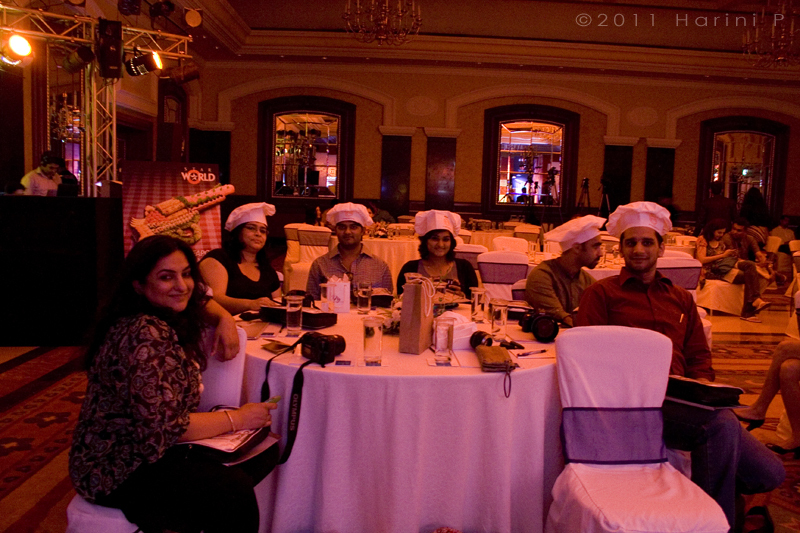 We entered together and I saw Rushina, Aneesh, Arpana and Pranav, wearing chef’s hats that read ‘masterchef’. There was an air of excitement around our table that was unmatched. The rest were journalists and the press. We were fans and food bloggers who understood the passion that goes on in creating a dish. I immediately removed my camera, fixed the lens, and opened the small pack that had been given to all of us. It contained a white masterchef apron, a cap and two oven mitts, which I think I will put to use only on very special occasions, and a small fold-able fork, knife, and can opener kit. For sometime we were a bunch of kids, playing with our new toys. The event kicked off with a very affable Kunal, himself a foodie with a great sense of humour, giving us a brief introduction of Matt. Next, Saurabh Yagnik, general manager and senior vice-president of Star India Pvt. Ltd., showed us an AV of all my favourite Star World shows and this was followed by a grand entry by Matt Preston. He came through a smoke screen in style. Matt and Kunal engaged in some friendly jibes and banter, which was followed by a cooking demonstration by the much acclaimed food writer and critic. He started off by making a watermelon, cucumber salad topped with feta cheese. This was followed by english muffins topped with smoked mayonnaise and few more non-vegan toppings. The dishes were plated for sampling and people started tasting it. I suddenly felt hungry as I watched everyone dig with gusto. I could not contain myself, so went up to the cooking platform and found that there were ingredients that could easily feed me. I requested Matt to prepare something vegan and he immediately dished out an easy and tasty topping over the english muffins. 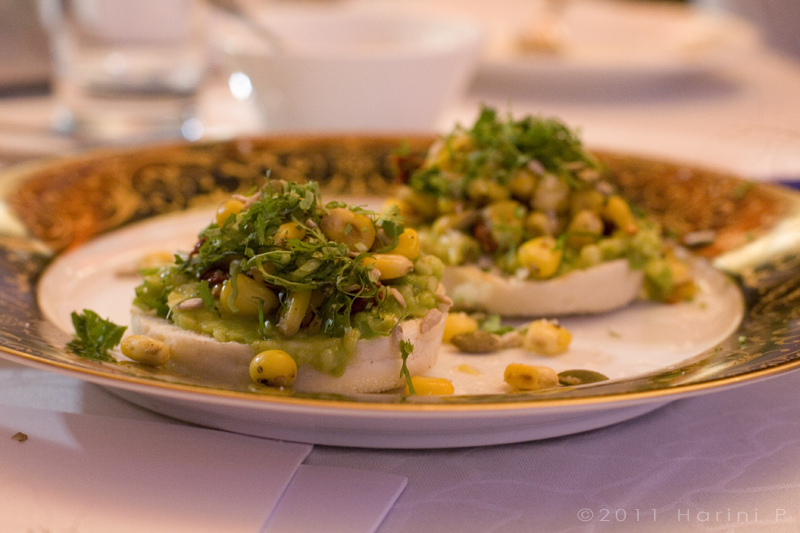 It was a simple but tasty dish, best for a hearty breakfast – split english muffins, toast, top with mashed avocado, followed by steamed and lightly roasted sweet corn, followed by a dash of lime and a sprinkling of chopped coriander. I was so busy with the knife, fork and mouth that I hardly heard him asking me whether I liked it. When others directed me, I just managed to say between mouthfuls that I was doing justice to the dish. For a moment my dish was a celebrity with everyone clicking it. For me it was a very special moment – the day Matt Preston cooked a vegan dish especially for me! The dish Matt Preston made for me!! This was only the start. There was a tasty spread laid out followed by question and answer session which took most of the time. We were all patiently waiting to be photographed with Matt, and got a few seconds to do that towards the end. We took some groups pictures too. In between Matt approached our table and talked with everyone and we got the opportunity to present him with our gifts. I gifted a cast iron skillet which I adore and Andhra mango pickle – avakkaya. I hope he likes them. I hope all of you are as addicted to MasterChef Australia, Season 3 as to the earlier episodes. We are buying a TV soon because I just can’t think of not watching the program!! My children who did not bother us during the cricket season, or on missing out their favourite shows have been bringing the house down because they miss not watching Masterchef Australia! You met Matt Preston!! Wow how cool is that! Would love to be able to have met him too. I’m a huge masterchef Australia fan too. I never watch any of the other masterchefs anymore. Not since I’v become addicted to the Australian version. We even have our own mystery box challenge at home now (black box we call it) and we get so inspired by masterchef.. Wow!!! I am a HUGE Master chef fan too…..and I can only imagine how exciting it must have been to meet Matt Preston in person. here’s hoping you have many more such opportunities to have ur dreams come true…! Wow, this must have been one amazing experience. Like millions, I too was addicted to the program & used to feel so let down when the Indian version came with Akshay’s filmy style. And to have the icing on the cake, Matt made a dish for you. SO so nice. Wow!I am so thrilled and happy for you. The dish does look awesome Harini! oh wowee – this is great; i am hooked to season 3 and the judges gary geaorge & matt with their vivacious persona have me enthralled- it’s a great honour to be part of somethg like this & MATT is just WOW ! sounds like you had tons of fun.. and dish specially for you! 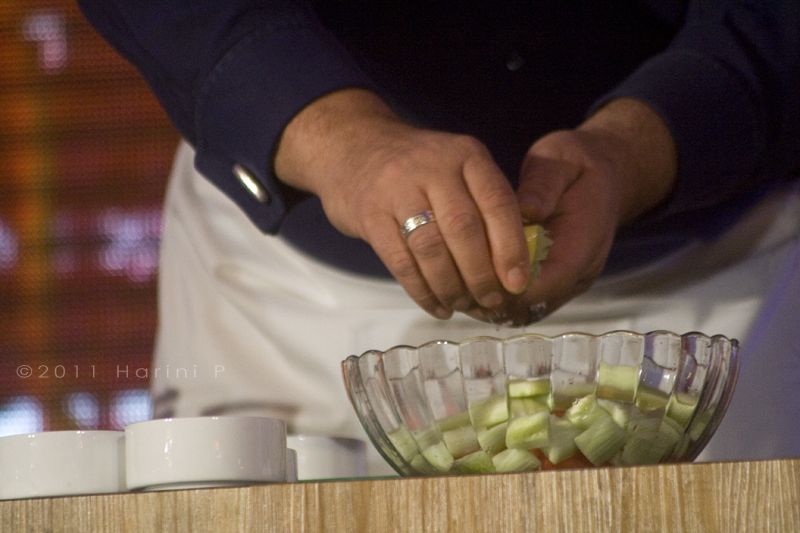 niiiceee..
i havent watched masterchef before.. not so much a tv person..:) but i can totally get the whole excitement..
seems like a wonderful day with fellow foodies and a masterchef cooking for u! Jaya, I assure you that at least half the Country was addicted to MasterChef Australia for sure. We would discuss the show and the challenges even during lunch at office. Sweatha, hope you saw the recipe for perfect sponge cake (my earlier post). I made this with you in mind too. I wish we had a TV now but I really want that camera as well!! Can’t have everything. :) Hey, we used to watch the Sunday afternoon reruns! I like hearing from people in prose style!! I wish I were there. GOD, I remember how much I HATED him during the show. I loved Jonathan, the Eliminator and was so heartbroken when he was eliminated (:sigh:) This season is very promising as well. Sincerely I wish I were there H.HE cooked for You. I am JEALOUS of YOU (Green eyed look)- can u see me glaring at you. Even I too will bring the house down if I do not see it. 🙂 that dish looks yum,,. BTW, what is story behind no TV? We have two but we hardly watch any shows. And no food network for us since we have basic cable. Though I do miss FN when we had six years ago.